My store website opened last week and I've had several orders to fill. 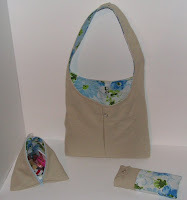 The most recent order I completed was for a hobo-type bag that I call the "Brooks" purse. 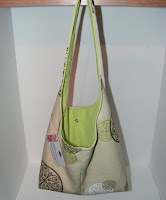 It's got a fairly neutral, sturdy outer fabric and is lined with celery green on the inside. It closes with a snap. I hope I end up with a happy customer! The next set is my favorite! Some of you know that I moved to Canada last June. 9 months ago I applied for my Permanent Resident Card, and I just recently got news that I was approved. Exactly one week from today I get to go pick up my Permanent Resident Card and I'll be all official. That means that I can take a trip back to the States to visit my family, and exactly two weeks from today I am traveling to Indiana to do just that, for the first time in a year. I'm so excited about my trip and getting to see my family and friends from back home that I wanted to make a new matching purse set just for the occasion. This is what I came up with. The purse is another "Brooks", the lined zipper pouch is a "Gadsby", and the sunglasses case I refer to as a "Sundre." (all cities in Alberta). They're all available on my store website if you're interested. I was wanting to make something new to use on my vacation, and the citrus liner fabric inspired the whole matching set. 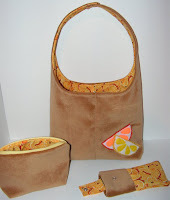 I even made the two little citrus-y felt appliques that you see on the front, and then I hand sewed them on. The purse and the glasses case both close with a snap, and I put the perfect sized pocket that I divided up into a cell phone section and a place to store pens, because those are the two things I tend to lose easily in the sea that is the bottom of my purses. Woohoo! I made another matching set this week, again, I felt like I needed something fresh and new to use as Spring finally showed Calgary some love. I enjoy the ease of the Brooks purse because I can throw it over my shoulder and have my hands free, and it's large enough that I can put loads of stuff in it. I used canvas for this set on the outside, and it's lined with remnant fabric that I found at a thrift store when Lucas' mom and I went shopping back when she was visiting us a few weeks ago. I think the combination is very fresh and crisp, and it's been a breeze carrying all my stuff around. This set has a Brooks, another Sundre, and the little triangular pouch is called a "Canmore." After using this for the first time yesterday when I went downtown to meet up with a friend of ours for dinner, I fell in love with the simplicity and functionality of the Brooks. It's perfect for running errands or being oot and aboot. I'm glad I made my vacation set feature a Brooks design, too. It seems like it'll be great for all the running around I plan to do when I'm in Indiana.